This will sound crazy but try it. I have spent a LOT of $$ buying every cleaner for the outsides, roof & awning of my RV's just like everyone. I have not found anything that works better and Easier than this and 4 the price, if you think it doesn't work at least you can use it in your house washroom 4 cleanup. ** Now you have to use this EXACT product in the aerosol can (the pump will not work). Scrubbing Bubbles not the same and Will Not Work I don't know why. Use this Lysol Foaming Cleaner Brand & Streaks Dirt Everything Wipes Off. Let me know what you think. I always have a can in the RV. Safe Travels! I don't think I've ever seen that. Thanks for the tip!!! Thanks for the tip...will get some for the awning etc. We use the WET DRYER SHEET idea on the front to remove bugs and their juice. I am good to try anything that works and doesn't harm the finish ! Never heard the dryer sheet? Never heard of the dryer sheet either but will try it. 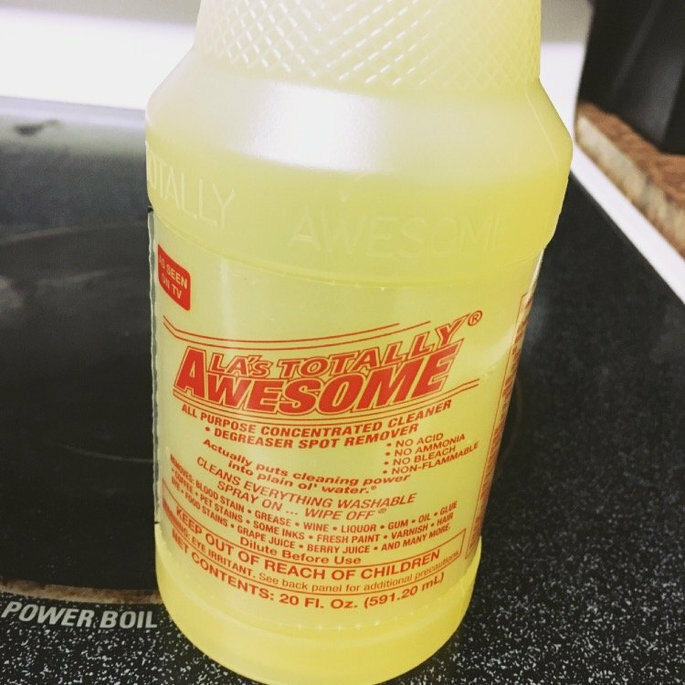 The best cleaner I have ever found is LAs Totally Awesome Cleaner. A 20oz spray bottle costs $1 at the Dollar Store. Going to buy a case. Fantastic results. I now use it for everything. The way that stuff burned my hands the last time I used it I wouldn't let it within a mile of my coach. Worked great removing the smoke stains off my stainless steel grill but I would not trust it around paint. I use it for black streaks, spray it on the cloth, wipe and then spray on wax. So far, so good. yes...it truly works ! Just dip a couple of them in a bucket of water...wipe/rub over the bug goop....I used a micro fiber cloth to wash it all off. Crazy... I will try it! The AXIS is a bug catcher. We use the Mr. Clean Eraser pad and water to remove the black streaks. So far so good. I have struck out at WalMart, Food Lion and Lowes hardware looking for that exact Lysol spray. Where did you find it Rev? Also, we use the Awesome for the stains on the awning...JUST BEWARE and use safety glasses (not just sunglasses like I did) as I got some in my right eye and it took several minutes at the eyewash station in the garage to get it to rinse out and quit burning!! I do get mine at the Home Depot in my area Indiana. The Lysol product will take off all black streaks everything nice and smooth with a sponge something I've been using for years just thought I'd pass it on. Off to Home Depo tomorrow. Found it at Home Depo, $2.98 each, got 6 cans. Now time to clean. Amazing how well the dryer sheets worked. Thanks a lot for that post, you saved me a lot of work. Worked great. Good discussion need it in my library.